Children who can recall their math facts quickly, are stronger with their fluency now and for future math problems, especially multiplication. 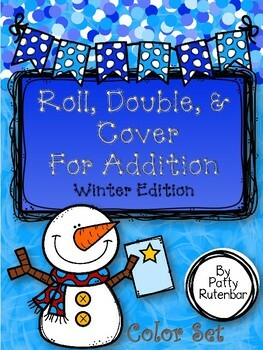 This is perfect for 2nd and 3rd graders. 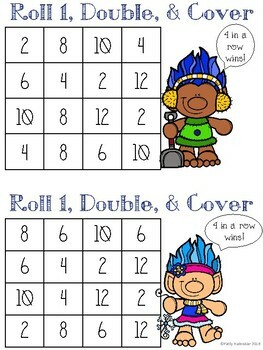 When your child plays these games they will be improving their fluency too! This set is a Winter themed set in color. There are 6 cards in each skill with 5 different skills available. 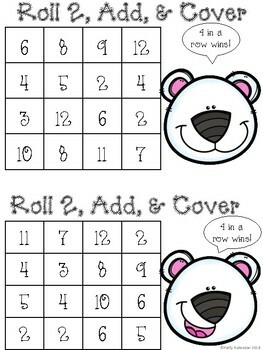 Your child will roll the dice. Look at the number on the dice and then do what the title of the card tells you to do. 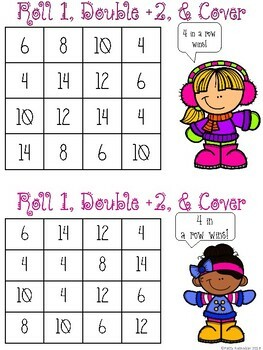 The different skills are: Add 2 dice, Double 1 dice, Double 2 dice. Double 1 dice +1, and Double 1 dice +2. Next they will find that number on the board and cover it with your marker. And finally when they get 4 in a row, they win! The black and white set is in this link.